The Holiday Season kicks off in just two days—two days, people! As you can see, fellow non-small talkers, I feel your pain. I jotted down some ideas this morning on how we might combat our complex. Feel free to add some of your own techniques or ideas in the comments section—and thank you in advance for not doing so. Because then I would have to find a way to thank you or validate you in a follow up comment, and I wouldn't know what to say, or I wouldn't do it right, and the whole thing would just be awkward and painful. Wear sunglasses and pretend you’re asleep. Ask people what THEY think about current events. No dialogue. Dialogue leads to argument. But just keep asking them what they think. “What ifs.” Instead of, how is work going, just start conversations with “what if.” What if you lost your job? What if baseball was never invented? What if thanksgiving was on a Tuesday? What if Jennifer Lawrence or Taylor Swift started flirting with me (something I’ve been worrying about lately)? Ask people what their hobbies are. Let everyone know that the news-industrial complex in this country is rotting out our brains. Ask them to boycott the 24 news cycle. You’ll have to think fast if they ask what that means, though, because I don’t really know. But if feels like it’s headed in the right direction. Hmm. Let’s think of a new way to talk about religion. Talking about religion is uncomfortable. But it’s a big deal, and I don’t like the idea of just leaving it out. Hmm. Maybe, ask people, if they had to invent a religion, what would be some of the components they would incorporate? What would be some hard and fast rules you would lay down? And then which rules would you throw in there that you know no one will ever keep, but for some reason you want to include them? If you want to end a conversation, just pull out your phone and start scrolling through your pictures, giving a detailed explanation for each one of them. Check every few pics to see if the person is still there. Movies! If you ever hear me talking about movies or televisions shows at a party, it is because I burned through the normal topics (work, school, family) in about 49 seconds. 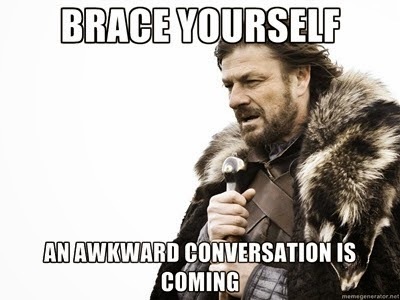 I wish all of my introverts much luck and success in this year's jungle of small talk. If you ever need any help know that you can't call me to talk about it—I will only exacerbate your issues. Give your mom or your lawyer a call—they are all too happy to keep you on the phone for as long as they possibly can.